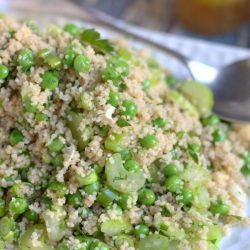 This super easy vegetable couscous salad recipe makes the perfect side dish for a summer BBQ. It can be pulled together in just 15 minutes and leftovers are brilliant in the lunchbox. Add the lemon juice and olive oil to a small jar with a lid. Season well with salt & pepper, and replace the lid. Shake the jar vigorously to combine the dressing. Taste the dressing. It should taste strongly of lemons. If it doesn't, add a little more lemon juice and shake the jar again. The lemon juice should be quite prominent in the dressing. Once you are happy with the taste of the dressing, set the jar aside. In a small saucepan with a lid, bring 1 cup of water to the boil. Remove the saucepan from the heat and add the couscous to the hot water. Stir briefly to ensure all of the couscous is saturated and replace the lid. Set the saucepan aside for 10 minutes whilst you prepare the other ingredients. After 10 minutes, remove the lid and drizzle the olive oil over the couscous. Fluff the couscous with a fork (not a spoon). Whilst the couscous is cooking, place the green peas into a small bowl and cover with boiling water. Allow the peas to sit for 5 minutes, and then drain. Once the couscous is cooked, tip it into a large bowl. Add the drained peas, celery, spring onion (scallion) and parsley to the couscous. Gently but thoroughly stir the vegetables through the couscous. Pour the dressing over the salad, and stir again to coat the salad with the dressing. Serve immediately or store in the fridge until required. *Check the packet instructions for the couscous. If it is vastly different from the instructions I have given, I recommend you follow the instructions for the variety you have purchased. Change up the vegetables in this couscous salad according to what you have in the fridge. Char-grilled vegetables work very well in this salad. Goats cheese, feta or even shredded poached chicken can all be added for a more substantial salad. This couscous salad will keep in the fridge for up the three days.